Experience the world's most beautiful harbour at full throttle, with sea spray in your face and the sweet sound of a 700 horsepower engine in your ears! Experience the world's most beautiful harbour at full throttle, with sea spray in your face and the sweet sound of a 700 horsepower engine in your ears! 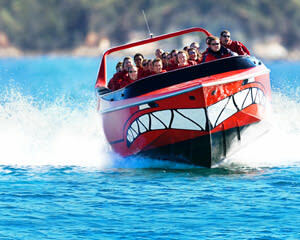 Jet boating on Sydney Harbour includes massive sideways slides, fish tails, wave riding and awesome spins as well as unique and breathtaking views of the Sydney Opera House, Fort Denison, Rose Bay, Goat Island, Taronga Zoo the Sydney Harbour Bridge and lots more. Your jet boat adventure begins at Circular Quay with a comprehensive safety briefing and a rundown of the trip ahead. In the boat, with the jet boat's power finally unleashed, you'll soar past ferries and experience a roller coaster of manoeuvres orchestrated by the jet boat pilot. Your jet boat ride is 30 minutes of non-stop excitement and thrills. Each jet boat ride can take up to 23 passengers. Rides operate hourly from 10:00 AM to 4:00 PM every day. Sydney Harbour never looked so thrilling! You may wish to bring a change of clothes in case you get wet! All passengers have seat belts and there are safety bars to hold on to during the ride. Children are 15 years and under. Vessel may be subject to change and may be replaced with another jet boat if required. Great Trip, highly recommended & make sure you take spare clothes as you may need them & you will get wet.. Sorry but I bought this as a present for my daughter and friend. I cannot carry out this survey as I wasn't there. But I know she had a great time. Well run, very exiting, loved every minute of the whole Experience. It was a great experience, highly recommend! Great fun to do with my family for my daughters 10th Birthday! While seeing the sites on Sydney harbour we got soaked with the adrenalin of jet boating!